In a small bowl combine the olive oil, seeded mustard and brown sugar mix well. Line a medium baking dish with baking paper. Lay the fillets in the baking dish and spread the mustard mixture evenly over the fillets to coat well. Roast the fillets in the pre-heated oven 18 – 20 minutes or until juice run clear when tested. Allow fillet to rest in a warm place for 5 minutes prior to slicing. 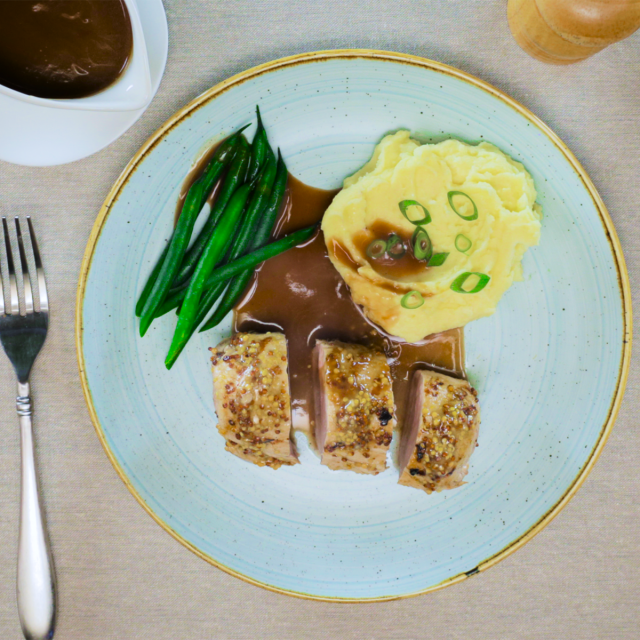 Slice the pork fillets diagonally into thick slices and serve with creamy mashed potatoes, steamed green beans and gravy. Garnish with spring onions. Notes: Resting the pork fillets even for a few minutes after cooking, will make your pork fillets always juicy and delicious when served.